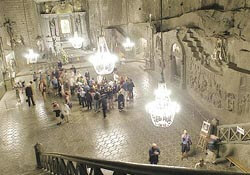 The Wieliczka Salt Mine is known as "the underground cathedral of Poland." This mine dating back to the 13th century stretches over 300 kilometers below ground and you can visit it while in Poland. 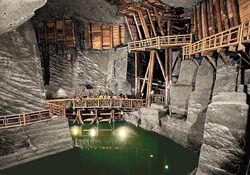 The Salt Mine is a major tourist destination near Krakow, and visitors are attracted here by a 3.5km long tour which takes in statues of historic and mythic figures as well as soaring rock salt halls and pits. The older works were sculpted by miners out of rock salt; more recent figures have been fashioned by contemporary artists. Even the chandelier crystals are made from rock salt that has been dissolved and reconstituted to achieve a clear, glass-like appearance. At its enormous size, the salt mine is an entire city which has been carved out of its very walls. Over hundreds of years, legions of anonymous workers carved bits of their workplace into everything they could think of, from saints to gnomes. Starting in the late 19th century, three miners decided to etch out a whole chapel as well, to the patron saint of mining, St. Kinga. It took them 68 years to finish the job. 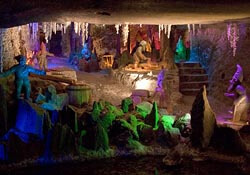 The Wieliczka Salt Mine also has an underground lake as well as exhibits on the history of salt mining. At one time, salt was as valuable as silver. The mine is actually even older than the 13th century, the first evidence of this mine's existence date back to 1044 A.D. Tourists have been visiting since the 15th century, one of the more famous visitors include Poland's famous astronomer, Nicolaus Copernicus. About 1.2 million people visit the mine each year. Buried up to 327 meters beneath one of the most Catholic countries on the planet, the mine also has restaurants, bars, and a formal dance area that is great for weddings. Some of the tunnels are so wide that they were used as airplane factories by the Nazis during World War II. To get down to the 150 meter level of the mine, visitors must walk down a wooden stairway of some 400 steps. After the 3km tour of the mine's corridors, its chapels, statues and lake, visitors take an elevator back up to the surface. The elevator holds 36 people and takes roughly 30 seconds to reach the surface. In 1978 the Wieliczka salt mine was placed on the original UNESCO roster of World Heritage Sites. Last updated by jack on 20 July, 2014 in Destinations. This is a wonderful site. I am definitely going to add it to my list of great things to do.